Yet another gorgeous image! Diggin’ the soft light here, great shot. Smokin’ image – I bet that was a thrill. Looks like you had a great trip, I’m keen to see what else you got. What?!? No camera trap this time? 🙂 That is one heck of a tight portrait Ron. Awesome! Great catch! Most excellent in light and detail! We all love the bears!! And you’ve gotten some awesome shots!! 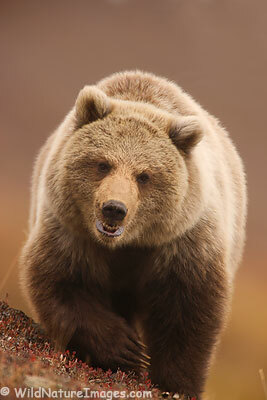 Carl almost became a take-out meal, just a surly bear!! Glad everyone’s o.k. Fabulous shot! Looks like s/he was smiling at you. Wonder if it was being friendly or laughing at your anxiety. Don’t think I’d wait around to find out.